Binh Dinh (VNA) – Investment group VinaCapital has injected over 1.1 trillion VND (47.4 million USD) into a project at the Nhon Ly – Cat Tien marine tourism area in Phu Cat district, central Binh Dinh province. 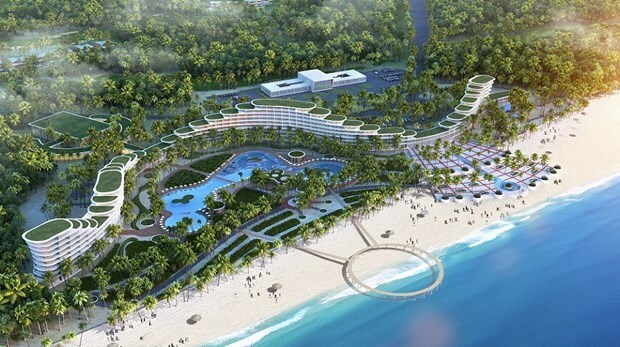 On March 30, the group kick-started the construction of the four-star Maia Quy Nhon Beach Resort on 34.15 hectares. The resort is designed with 755 rooms, and 80 percent of its villas have swimming pools and outdoor living space. Vice Chairman of the provincial People’s Committee Nguyen Phi Long said the project is expected to promote tourism in Binh Dinh. He stressed that the province is investing to build a road connecting Phu Cat airport to Nhon Hoi economic zone, and Cat Tien urban area. This will help ensure the success of the resort and other tourism projects, Long said. Chief Operating Officer at VinaCapital Brook Colin Taylor said he is confident that the Maia Quy Nhon Beach Resort will become one of the most popular destinations of tourists in the future. Binh Dinh welcomed more than 4 million tourists in 2018, up 10.6 percent from a year earlier. Among the visitors, there were over 286,400 foreigners and 3.8 million domestic holiday makers, respectively rising by 8.3 percent and 10.8 percent. The province recorded a surge of almost 55 percent in tourism revenue to reach 3.3 trillion VND.